"Cooking" requires a degree of heat that isn't appealing at the height of summer. Without air-conditioning. Little wonder then that Mother Nature made it so that the food emerging from the soil and pops up in markets Farmer and Super particularly good. The point being, you don't really need to do anything to it. My sort of summer cooking is more assembly than anything. Despite the allure of pies, I try to keep baking to a minimum. The less time with heat the better for me — and the food. In that list of assembly-friendly food, of course, is the salad. Its attained an iconic status, synonymous (with bottled water) with the ascetically healthy, the Sizzlers of the world and their buffets. The salad is almost regarded as a punishment for past gluttony which is a shame considering how it's best suited to the bountiful part of the year. So why the hell am I using cabbage? Simple. Ever heard of coleslaw? A roast chicken dinner followed by a slice of warm pear clafouti doused in cold heavy cream and a shot of bourbon to go along with it. Especially appropriate when comfort is quietly needed. Even better when it's captured in words and a very rough image. Mom and anyone else who speaks better Korean than I do calls it sam gye tang. 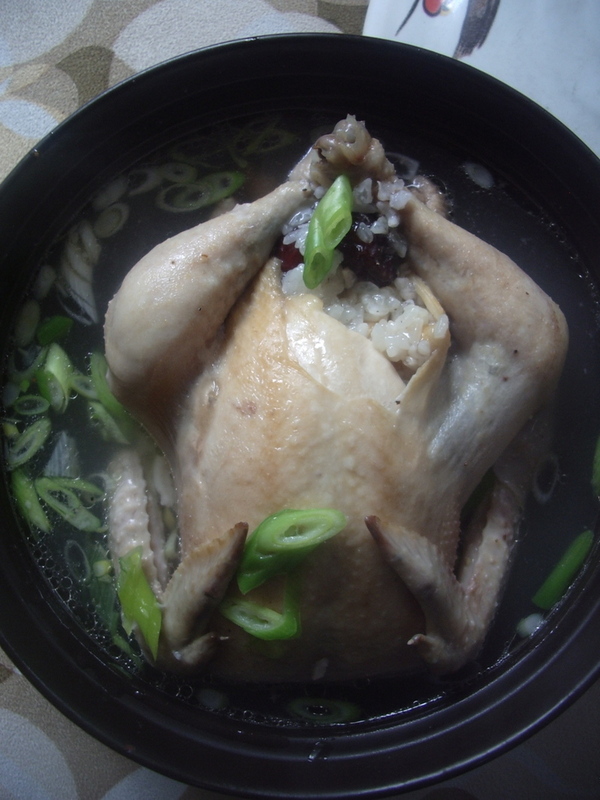 I call it Chicken Ginseng Soup which is a bit of harmless misnomer. Only because the chicken is actually a Cornich Rock Game Hen -- a long name for a tiny bird that's usually found rock hard deep in the freezer section. Along with a handful of ingredients, it transforms a pot of water from something merely hydrating to a healing pot of soft broth that can make you feel good down to your bones. And it's what I can only resurrect when I or the people I care about need something that tastes better NyQuil. I love it when my friends let me feed them. Case in point, a photo shoot with my photographer friend Adam and a few other willing folks. The goal of the evening was to practice food styling and photography and, of course, eating together. Being the carnivore that he is, Adam requested to shoot meat. "We've never shot anything with bones before," he implored. So I obliged. Simple chicken. I don't remember where I got the recipe. It seemed I'd made it so many times before it was more of an intuition than a recipe. 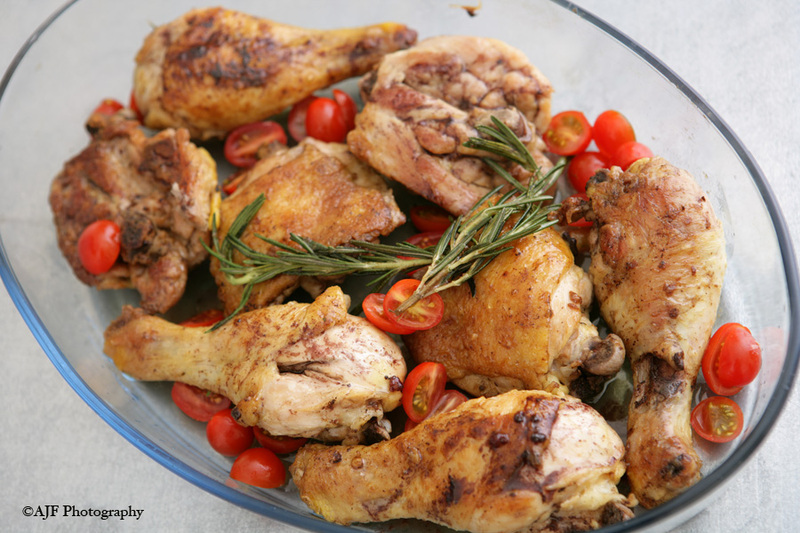 Thighs and drumsticks, sauteed, and roasted with rosemary, a bit of wine, and showered with fresh ripe tomatoes. It is summer after all. The photo above is the real deal. No fake coloring touch ups, no fake meat, or falsely cooked. It was still sizzling from the oven and perfuming the studio when Adam was shooting frame after frame. Not too long, though, for the dish was still succulent and warm when we all dug in. I like dark meat, so I prefer to use thighs and drumsticks. If you buy the whole leg, cut through the joint with a knife to yield to pieces. Of course, you can use a whole chicken you've so deftly cut into serving pieces yourself. Excellent warm, it's also stunning cold as leftovers. Heat a large sautepan over high heat. Reduce to medium, add a glug of olive oil and a pat of butter. Add the chicken pieces (making sure they're patted dry) and saute until golden brown (about 5 minutes). Turn pieces and cook until golden, as well. Remove pieces from pan and set aside. With the sautepan over medium heat, add the shallot and saute until translucent, adding more oil or butter if necessary. Using the spine of a chef's knife, bruise the woody stem of the fresh rosemary sprig. Add this to the pan and stir for a minute. Add a glassful (or two) of white wine and deglaze the pan scraping up the browned bits. Return chicken pieces to the pan in a single layer (or transfer to a casserole as pictured above) and place in a preheated 400 degree oven. Cook for another 30 to 35 minutes. During the last 15 minutes of cooking, add your tomatoes. Or you can them fresh, depending on how good the tomatoes are. Serves 6.